it's better to use your most favorite or most important notebook. the result will cheer you up and you will be very happy every time you hold it wherever you go! 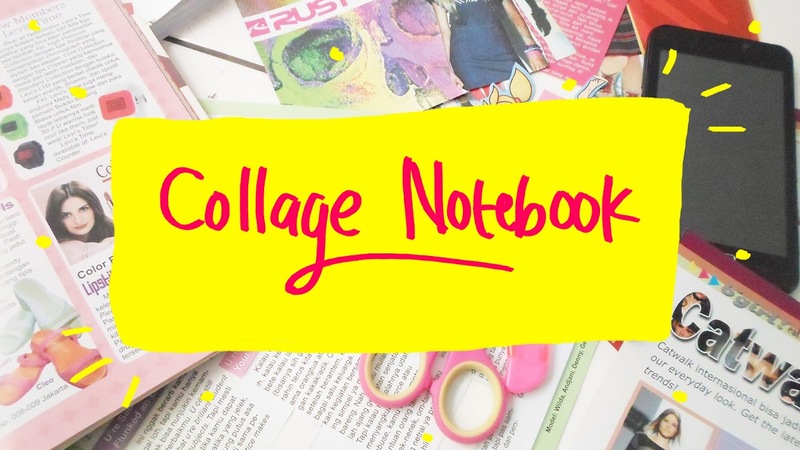 to design your new notebook cover with collages, you may need any kind of used magazines (we can pick its texts or pictures from their articles). if you don't have any used magazine you'd like to cut then you can use origami paper or anything you feel nice to paste on. after cutting the collages from your sources, now it's time for placing. note: we don't use glue in this step. simply place your collages to measure where you have to put them and fit the cover perfectly. mine is like the picture below. I have some collages which placed between two other collages because I want it to look messy and unstructured. if you are sure enough with the collages placement you just did, now, it's time to glue all of them on their back-side and place it where it should be. of course with the paper glue! after gluing all collages, now, it's an optional step. you may do it or not. I use this puncher to make a simple confetti by punching my favorite colored magazine pages. you have placed anything very well! now, it's time to finish the step by put this white glue on the surface. it's good to make your collages stay still and lock the color. also, it makes the collage paper become harder so it won't easily torn or peeled. EVEN THOUGH THE GLUE IS WHITE AND WHEN YOU APPLY IT ON YOUR COVER STILL SEEMS WHITE, DON'T PANIC! IT WILL TURN TRANSPARENT ONCE IT DRY. all you have to do is to put the glue until it covers every inch of your collages. you can put the white glue as much as you want. it's an optional step but I recommend you to follow this step to protect your collages from dirt, dust, stain or nasty fingers that would harm your cute DIY notebook collages. I hope you like reading my blog. keep following me on social media to get the latest blog update!